Tony Savarino is available for hire as both a session guitar player/and or producer. 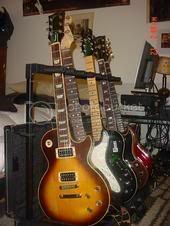 In additon to getting a great guitar player Tony also has a beautiful collection of guitars, amps and other toys to help your next project sound great!!!! He has worked in all the top studios in Boston and over the years has cultivated many longstanding relationships with many of New Englands recording engineers, producers. musicians, recording and mastering studios.